1) A springish outfit, possibly featuring pastel colors? 2) Some things you like to do in the spring time. 3) Do you enjoy the spring time? Why or why not? 4) A photoshoot of the flowers blossoming. 5) Write a sweet spring poem, or one about why you dislike spring. 6) Colors that remind you of spring and why. 7) Go somewhere that reminds you of spring and blog about it! 8) Create a spring inspired playlist and share it! 10) Take pictures of flowers, or buy flowers, put them in your room, and share about it! 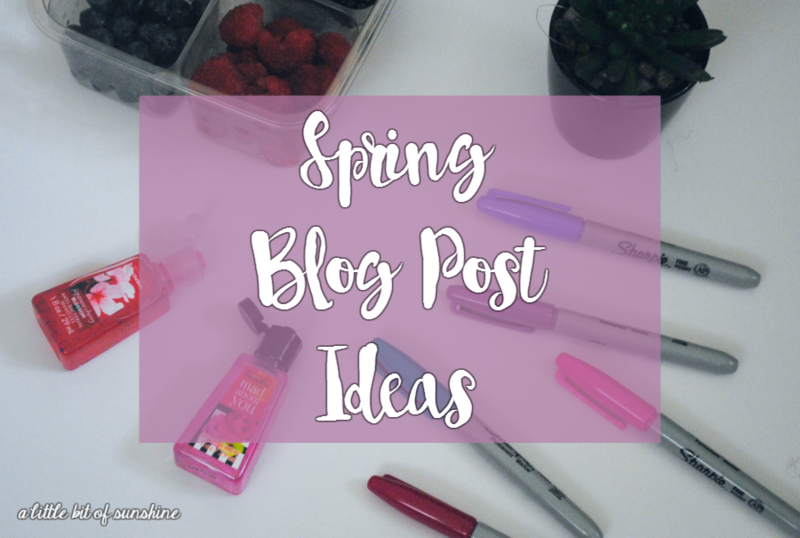 11) Go on a spring like adventure in your backyard and blog about it. 13) Create a tag, maybe about flowers, or colors, or just anything spring! 14) Your favorite spring nail colors, or lipstick colors, or lotions, soaps, etc. 15) Start a book club with some bloggers! 16) Create a recipe involving fruit, fruit is quite springlike I suppose. 17) Write about how to transition from winter to spring. 18) Your favorite spring time quotes. 19) Share a video of a pretty lake or park, you don't have to put your face or voice, just slap some music on it and you're good to go! 20) What books remind you of spring? Tell us! Hope this post gave some of you some inspiration! I might try out a few of these myself. If you try any of these ideas, link your post in the comments, I'd love to check it out! It's not Spring in Australia, so I'll change them into Autumn ideas! I will probably try 2, 4, 8, 12, 13, 14, a tiny bit different but only a tiny bit version of 17, and maybe 1, 5, 18, and 20. Cool ideas, I might try some of them! Great idea's I keep these in mind when I get bloggers block! DUUUUDE YOUR NEW DESIGN I LOVE IT. What program did you use to make the header? Oh, and by the way, I LOVE YOUR DESIGN!